First and foremost of course is the use by date on the carton/box, eggs when purchased should have at least two weeks use by date, preferably three to four. This will depend on the dating structure of the company, I suggest you purchase from the same 'brand' and become familiar with it. They may only put a two week use by date on for example. 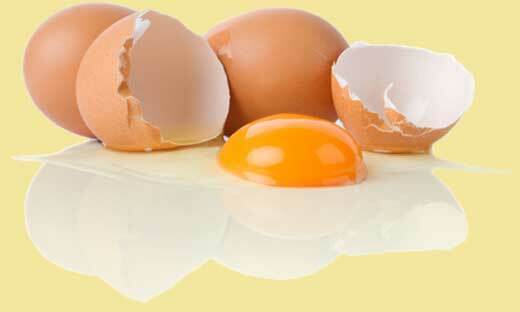 But eggs that are within a week of their use by date are best used for frying, boiling etc but not for baking. Inside an egg (at the rounded end) is a small air pocket that is barely noticeable when it has just been laid. But as the egg gets older the air pocket increases in size, this also displaces the egg yolk within it. Ever noticed when you boil an egg that the round end is flat or even dips inwards? That is the sign of a stale egg. Also when fried the white of this stale egg will run all over the pan instead of retaining a tight shape. A fresh egg will sit horizontal at the bottom : these eggs are suitable for baking (but preferably not meringue) and will maintain a good tight shape when fried or poached and the yolk should stand quite high with a good semi circular shape. As the egg increases in age and the air pocket gets bigger it will tilt upwards slightly: these eggs are suitable for meringues, baking and will maintain a reasonable shape when fried or poached, the yolk will be flatter in shape. An egg that sits vertically is stale: these eggs are not really suitable for baking, are best used for scrambling or omelets, will not maintain even a reasonable shape when fried or poached, the white will spread and the yolk will be quite flat. When trying to separate, the yolk will probably break as the egg white that surrounds it will be weak. An egg that floats should be disposed of (carefully).